It was July 17, 2010. They came from far and near to take part in the fifth largest kubb tournament in the world, and easily the largest outside of Europe. 64 teams and 140 players showed up at Boyd Park in the Eastside Hill. Players came from the Golden State, Big Sky Country, the Peace Garden State, and the Sunflower State. They were also neighbors from Minnesota, Iowa, and the Land of Lincoln. Roughly one-third of the teams were from the Badger State. Of those Wisconsin teams, six came from the Eastside Hill to go head-to-head with the nation’s finest. Four of these teams, East Siders (3-0), The Pickled Herring (3-0), RRRomantickubb (3-0), and The Ringers (2-1) all finished at the top of their respective four-team groups, with The Pickled Herring knocking off Team McKie, a Minnesota team that has finished in the top three the past two years. The other two teams, Punks and Hurly Thump, competed hard throughout the day, staged tough Eastside Hill competition, and represented the Eastside Hill with class, dignity, and perseverance. As the morning turned into the early afternoon, and the early afternoon turned into early evening, battles were had on all 32 pitches. These battles left Eastside Hill and Eau Claire teams by the wayside. However, seven of the final 16 teams came from Eau Claire, and The Ringers were the lone Eastside Hill survivor in the National Championship. Then the water started dropping from the sky. This cool rain proved to be a saving grace for players who had sweated and baked in the July sun for the better part of eight hours. 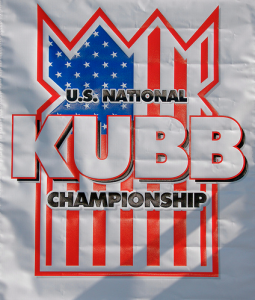 Soon, the 16 teams were reduced to eight, and there were now four Eau Claire teams (Kubbitz, Kubbsicles, Default, and The Ringers). Again, The Ringers survived to the quarterfinals and were to meet Team McKie, the team that had finished 3rd and 2nd in the previous two years. Team McKie won the first game and nearly had the match won. However, being Eau Claire Berserker Kubb Club members mean that you never give up and you fight and claw through any circumstance. That is what Dave and Aaron Ellringer did. Taking advantage of opportunities, The Ringers found themselves victorious with a 2-1 match win, in what could have easily been a semifinal or final match-up. On to the semifinals. There was no rest for the weary. 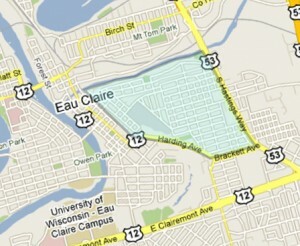 Two of the final four teams were from Eau Claire…the other two from the Land of 10,000 Lakes. 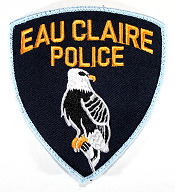 The Eau Claire teams were The Ringers and Default, who was made up of brothers Nate and Scott Forster who recently started playing the game this year. They were matched up against Time Math, a last-second entry from Eden Prairie, MN, but who had sharpened their skills on the highly competitive kubb pitches and tournaments at UM-Duluth, as part of the university Kubb Club. The Ringers were set to play Tad Kubbler, a hungry and highly-trained team from Minneapolis, that finished 4th place in 2009, and who had beaten The Kubbsicles, a young high school team from Memorial H.S. in Eau Claire, in the quarterfinals. The winners of these two games would play for the 2010 National Championship. With all four teams knowing the National Championship Game was within one win of them, toe-to-toe battles ensued. There is a saying about kubb. 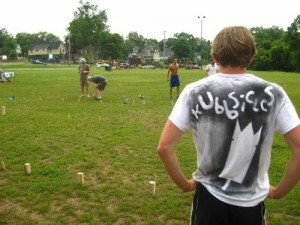 It goes, “Kubb unites people and creates peace on Earth”. At the National Championships, you can say that during the morning and afternoon, but come the evening when all is on the line, it is an all-out competition to see who will blink first and who can take advantage of any mental or physical mistake. At this level two things are important. If a mistake is made, you have to end the game and do it now. There are no second chances and momentum will quickly switch. Second, if no mistakes are made, all players on a team need to be focused and effective, and large amounts of wood need to be falling down. After the two semifinal matches, only Eau Claire was standing. Default versus The Ringers…in the final. The Ringers had been playing non-stop for roughly three hours while Default had been waiting in the finals for what seemed like three hours. The locals who had been playing kubb for as long as almost anyone in town (The Ringers) versus the locals who had just started playing (Default). The first game went relatively quick as The Ringers eliminated Default’s five baseline kubbs instantly. Default, again being Berserkers, did not roll over. They battled hard, but the circumstances were too much against a team in the finals. In the second game, Default, who could have easily mentally and/or physically folded, battled and a highly competitive game was had. However, the short-range throwing of Dave Ellringer and the long tosses from Aaron Ellringer were too much, and with one last toss at the king by Aaron Ellringer at 8:02pm, arms were raised and a yell of exuberance and exhaustion was seen and heard in the Eastside Hill. 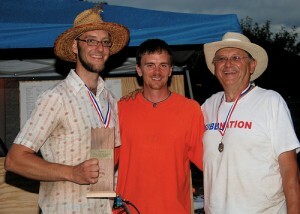 The Ringers, the Eastside Hill’s own, had won the 2010 U.S. National Kubb Championship. The 2010 U.S. National Kubb Championship was the fourth annual kubb tournament in Eau Claire. The tournament raised over $2500 for Girls on the Run of Eau Claire County and USA for UNHCR for refugees from Darfur Sudan. You can read more at www.wisconsinkubb.com. 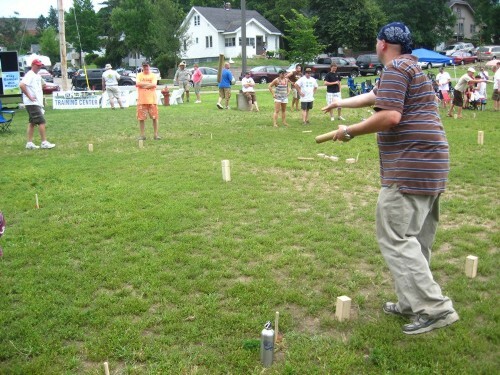 Habitat for Humanity will be hosting a September 18th Kubb Tournament at Boyd Park. This is open to all levels of players, even beginners. Check out tons of photos here!